There’s no doubt that Richard Julian’s participation in The Little Willies went a long way toward elevating his profile. After all, any outfit that also features Norah Jones certainly would. Nevertheless, Julian remains better known as a songwriter than a recording artist. He is neither flashy nor showy, and like Bruce Cockburn, there’s an understated, candid quality to his delivery that makes it relatively easy for his material to go unnoticed. 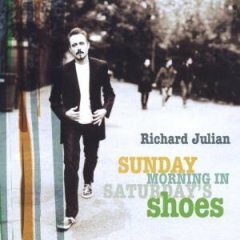 For his latest effort Sunday Morning in Saturday’s Shoes, Julian tapped attention-grabbing producer Mitchell Froom for assistance, but the resulting endeavor doesn’t really alter this well-ingrained perception of Julian’s output. Like his previous albums, Sunday Morning in Saturday’s Shoes takes awhile to resonate, but this time, his poetic charm slowly unites the material to push it over the top. Even with Froom’s presence, the music on Sunday Morning in Saturday’s Shoes is fairly run-of-the-mill. Opening cut World Keeps On hints faintly at Elvis Costello, and allusions to Paul Simon’s early solo work drift through tracks like Brooklyn in the Morning and A Thousand Days. Elsewhere, Froom and Julian more overtly sculpt Spring Is Just around the Corner into a Lyle Lovett-inspired blend of jazz, country, and blues, while Can’t Go Back uses its bass line to carry Mississippi John Hurt further down the river to New Orleans. To the arrangements, Froom adds enough ambience — such as the swirling carnival lights, which emerge from within A Thousand Days — to keep things interesting, but not so much that he overpowers Julian’s fragile melodies. Consequently, Sunday Morning in Saturday’s Shoes initially appears to be innocuously pleasant, but with time, it reveals itself to be something more. The funny thing about how Froom chose to frame Julian’s words is that, as Sunday Morning in Saturday’s Shoes plays, certain key lines become highlighted. Julian cleverly tucked subtle observations about America’s current social and political climate into the nooks and crannies of the tales that he tells. In particular, he highlights how disconnected the country’s citizens are from the global community. Near the conclusion of World Keeps On, for example, a couple watches the war as it unfolds on television, but they worry more about having left their suntan lotion at home. Elsewhere, Julian is more direct, taking aim at the exportation of consumerism on Syndicated. In between, he tells tales about a man who digs his own grave and dies in isolation with the riches that he found (Man in the Hole), while the title track is about coming face-to-face with the realization that Saturday’s sins have left their mark.